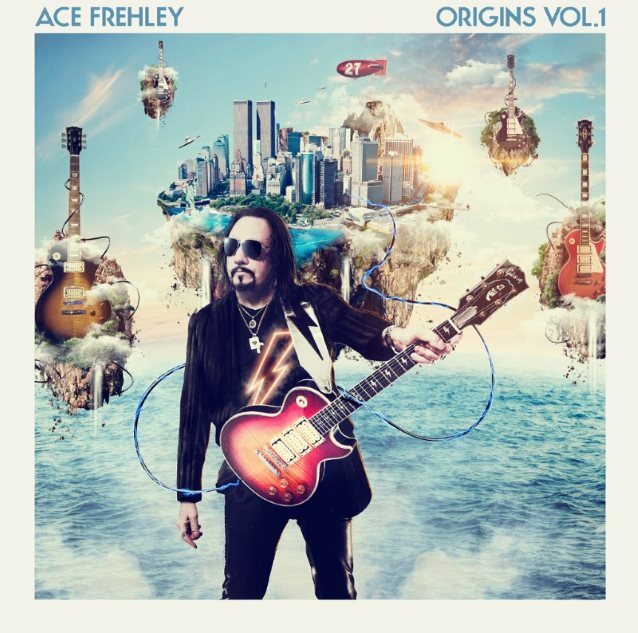 Ace Frehley has also recently released a new album of covers and old favorites, 'Origins Vol. 1.' He recorded songs he grew up with and that have influenced him. Among several guest musicians, including Slash, Lita Ford and John 5, is Paul Stanley. For the first time in 14 years Paul and Ace perform together. They play on the song 'Fire and Water,' originally done by the band Free. The video for that song was released on Tuesday. I must admit, as a Kiss fan I'm loving this little reunion. And the rest of the album is a lot of fun, too. Listening to Ace so much recently has reminded me of when I saw him back in November 2009. I did write about it here back then - over a few different posts, but long before I had started wrapping that stuff up into LLP posts. Well, now Ace is officially on that list. Here's a video from that November 7, 2009 show at the Majestic Theater here in Madison. 'Parasite' is on the new album, studio recorded for the first time by Ace (along with 'Cold Gin'). Not my video here, I was a person or two back and dead center stage. Strike number one, Crystal, at 608 286-xxxx, called 8 times without leaving a message. Strike number two, after I finally called that number back and let her set up an appointment she made sure to say at the end of the call to make sure that my wife and I are both there. That tells me they are going to want to leave with a signed deal, and be persistent about it. Strike number three, after discussing my porch project to a befuddled representative, I said never mind, if that's not what you do then let's talk about the other project, a new roof, and we did. He said he would get up there and get me a quote and went back to his car and left. I find this all rather funny, how about you? You know, I don't even trust this website. I shall not submit this to you, but perhaps call you out on my own site. From first shaking hands he acted like he was not told about the porch part of the equation. It was not what he normally does, even though his business had 'remodeling' in the name (a local contractor affiliated with the larger company). After he repeated again that this is not normally what he does I said well, then I wouldn't be inclined to hire you for it, let's talk about the roof then, and we did. He said he was going to get his ladder to get on the roof and take measurements to get me a quote. 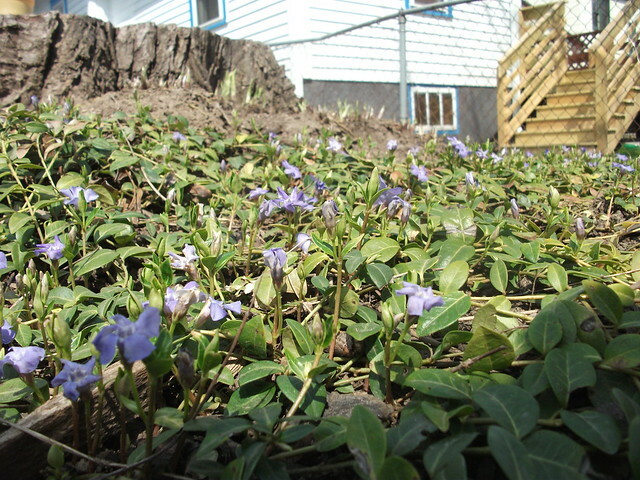 I wandered the back yard for a few moments picking at weeds, never did hear a ladder. I walked over and looked up the driveway and he was gone. Kate and I both were very surprised, bemused, and then even amused at the whole encounter. Your Home Improvement Co is certainly not mine. What a difference a week can make! I posted a bunch of pictures last week, and this week the growth is obvious. Since then, Kate has spent much time in the yard and garden. 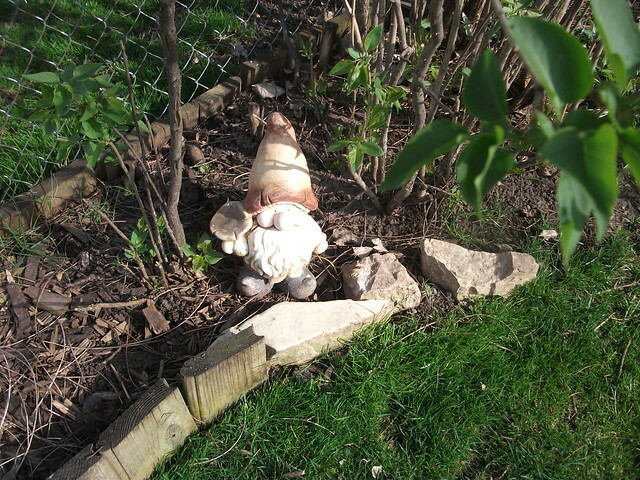 The gnome has been put back out making it officially spring in our yard. 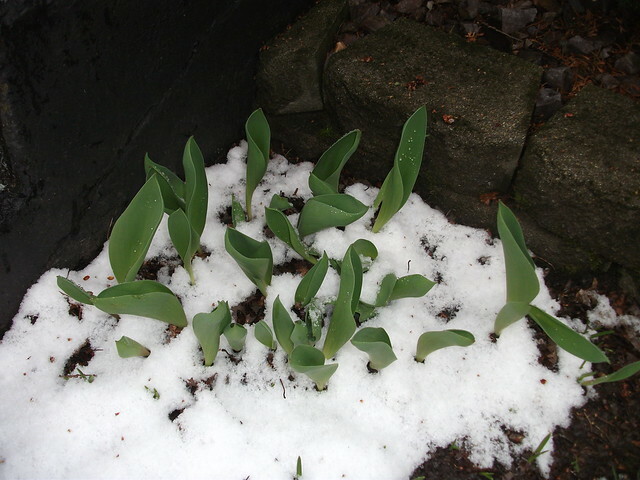 The tulips below are no longer in snow. 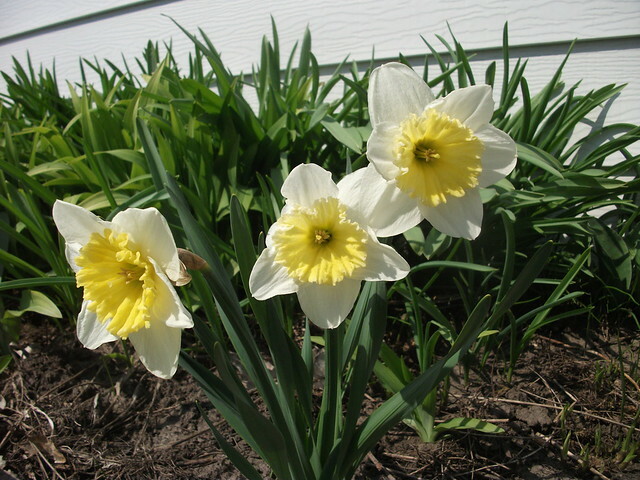 Like last week, visit the Garden Blog for all the yard and garden pictures! Whaddaya want? They're cats. You try to get them to pose for a picture! Basil and Hamish turn 4 today, or about today. April 20 is the estimated date of their birth by the vet that examined them after they were found and taken in by Dane County Friends of Ferals. 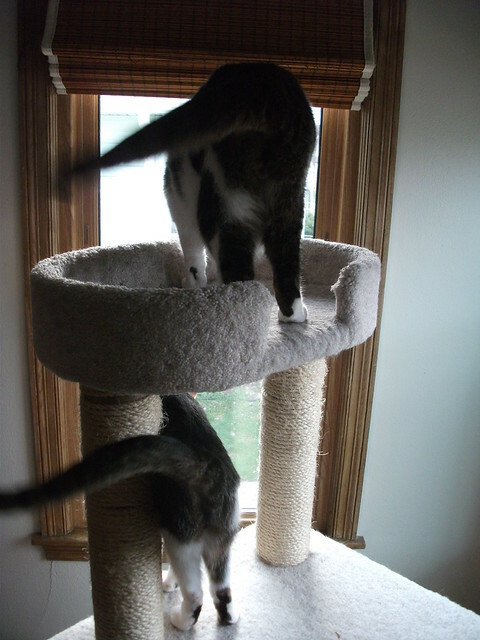 They were so tiny when we got them, that was June 9 almost 4 years ago. We wanted two male brothers and we got them. And they get along as well as we could ever hope. But for brothers they could not be more different, body types and personalities, and that does keep it interesting! Happy Birthday Hamish Pie* and Basil Boo*! With five of my last six posts having 'Spring' in the title, it has finally come true. We had the windows open for the first time this year yesterday and today I am wearing shorts as it may come close to 80º! Along with the nicer weather comes work to do. My wife spent much of the day yesterday working outside. 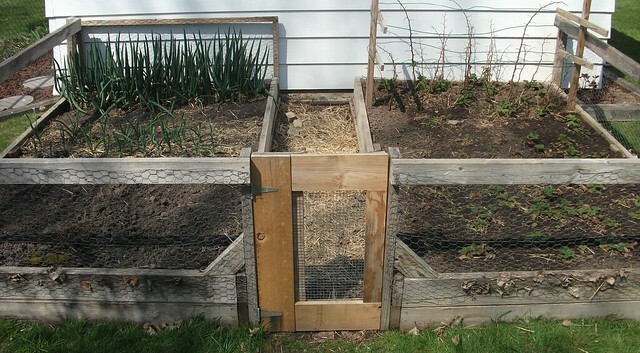 To see these pictures and more, stop on over at our Garden Blog! Some crazy, cold-loving Norwegian up to his old tricks skating/swimming/skiing while drinking vodka. I like this guy's videos. Just consider what he's doing, then realize how good a video he made and edited of himself doing it. Now how crazy is he? When we woke up this morning it looked much like my last post. It snowed most of the early morning with some accumulations but with temperatures at or just above freezing it was melting immediately on roads and walkways. Then it went from snow to sun to snow to sun, more times than I could count as we were in and out much of the day, until it finally stayed sunny sometime after 3 o'clock this afternoon. It was rather amazing, just watching the weather out the window change. In a matter of minutes it had gone from sunny to blizzard-like. And this happened several times throughout the day. Watching the radar you could see band after band of snow, like tiger bands, with a separation between each where we had partial to full sun. Many times it was sunny with snow still falling. 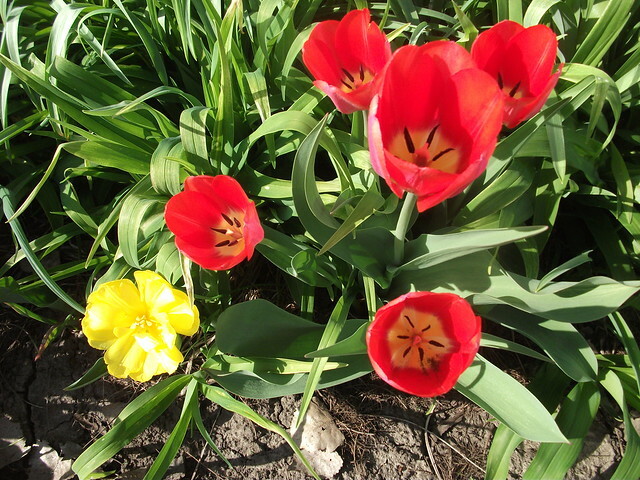 Not Tulips. 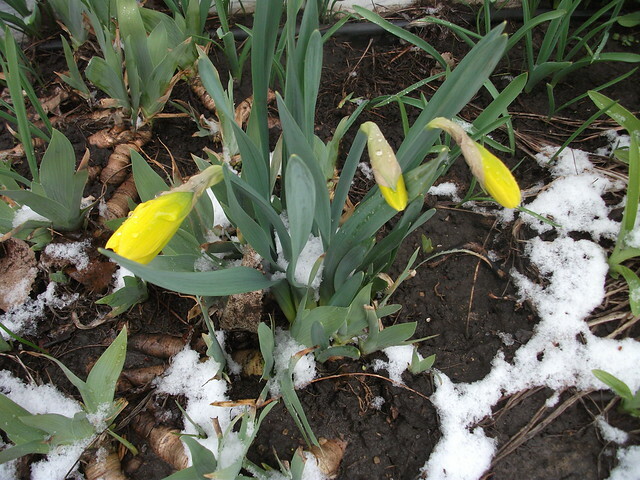 Daffodil among the coming Irises. A tiger striped late spring snowstorm. Odd kind of weather pattern, I'm sure, and interesting but unless I hear otherwise I will not delve further than what I may happen to hear of the local meteorologists. Who knows? It could have been a pretty rare snow weather phenomena. And it would have made a wonderful time lapse video. But as long as it is not a harbinger of the apocalypse then I'm good.